Over 150 PRX150 Attenuator Audio/Video Clips can be found below and on the featured artist pages. Scroll to the bottom for links to the individual artist pages. We thank all of our customers who has sent us their audio and video clips. The clips have been provided by hobby guitarist through professionals, from all over the globe, all sharing the same passion for great tone. Don Grosh ElectraJet > Vintage TS808 (melody/solo) > original Dumble Steel String Singer > PRX150-Pro (4 to 16 ohm conversion) > Avatar 1x12 open back cab loaded with a Scumback M75-HP-LHDC > Royer 121 > Avalon M5 mic pre > Pro Tools. Don Grosh ElectraJet > Vintage TS808 (melody/solo) > original Dumble Steel String Singer > PRX150-Pro (4 to 16 ohm conversion) > Avatar 1x12 open back cab loaded with a Scumback M75-HP-LHDC > Royer 121 > Avalon M5 mic pre > Pro Tools. 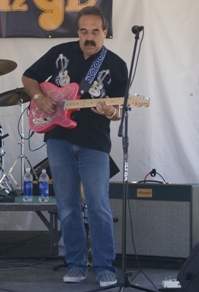 George Alayon - Professional guitarist, song writer and producer. 1964 Fender Strat -> Metro Plexi Amp -> PRX150-DAG -> Marshall 4x12 loaded with H-75 Scumback speakers. Marshall and Friedman Marsha Amps -> PRX150-DAG -> Marshall 4x12 loaded with H-75 Scumback speakers. 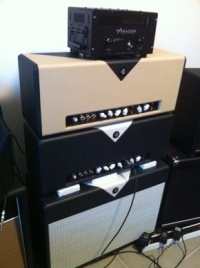 George Alayon's - "The Perfect Soul"
Friedman Marsha Amp -> PRX150-DAG -> Marshall 4x12 loaded with H-75 Scumback speakers. 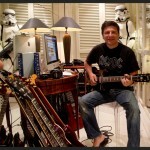 All of the instrument tracks were performed by George, including guitar, in his original songs "Disturbed" and "The Perfect Soul". 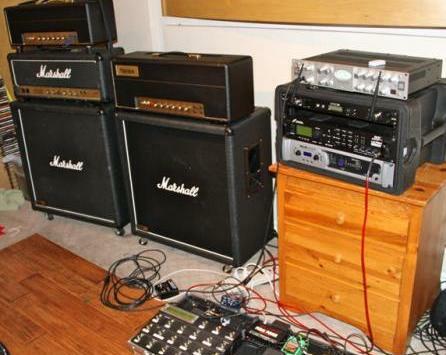 George uses his PRX150-DAG to record his cranked up amps at a bedroom level. Click Here for detailed information on the gear used for the above songs. George Alayon - Rock of Ages Band - Friedman and Marshall JCM800 amplifiers, PRX150-DAG - performing Queen's Fat Bottom Girls live. 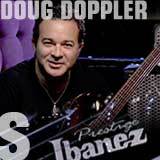 Doug Doppler's "Get Killer Tone" DVD series. An original Dumble Steel String Singer with the PRX150-Pro. From Doug Doppler's "Get Killer Tone" DVD series. Equipment used: Don Grosh ElectraJet > Vintage TS808 (melody/solo) > original Dumble Steel String Singer > PRX150-Pro (4 to 16 ohm conversion) > Avatar 1x12 open back cab loaded with a Scumback M75-HP-LHDC > Royer 121 > Avalon M5 mic pre > Pro Tools. Stefan was kind enough to create this video clip showing examples of the PRX150-DAG at various attenuation levels. Gene Baker "Mean Gene Band (MGB)" Live, Baker b3 Guitar, ARACOM Evolver 50 amp "dry side", ARACOM VRX22 amp "wet side", PRX150-DAG attenuator. Filippo F. Olivieri's (Italy) PRX150-DAG "Boston (Party) Demo". Filippo F. Olivieri's (Italy) PRX150-DAG "Black Robot (Cocaine) Demo". Wizard Amp + ARACOM PRX150-DAG. Filippo F. Olivieri's (Italy) PRX150-DAG "AC/DC (Have A Drink On Me) Demo". Attenuation level "F" (Variable Attenuation mode) providing approximately 20dB of attenuation, reducing his Metropoulos JTM50(GZ34 Rectifier/Pair of EL34s) amp's power out to less than 1 watt. Filippo F. Olivieri's (Italy) PRX150-DAG "AC/DC" Demo. Attenuation level "F" (Variable Attenuation mode) providing approximately 20dB of attenuation, reducing his Marshall JMP(Plexi 50) amp's power out to less than 1 watt. Filippo is located in Italy and is the founder of www.solodallas.net, a website providing guitar tutorials, product reviews and more. Filippo F. Olivieri's (Italy) PRX150-DAG "AC/DC (If You Want Blood) Demo". 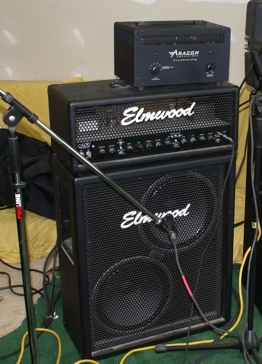 Attenuation level "F" (Variable Attenuation mode) providing approximately 20dB of attenuation, reducing his Marshall JMP(Plexi 50) amp's power out to less than 1 watt. Derek Fuller - Lead Guitarist - Fan Halen Band (www.fanhalen.net), cranked up Marshall Plexi, PRX150-Pro. YouTube find: Nik Huber Dolphin guitar, cranked up vintage Marshall amp, PRX150-Pro (heavy attenuation), 4x12 cab. Thanks to Spiraless, a jazz-fusion instrumental rock band from France. YouTube find: James Trussart Steelcaster guitar, cranked up vintage Marshall amp, PRX150-Pro (heavy attenuation), 4x12 cab. Thanks to Spiraless, a jazz-fusion instrumental rock band from France. Part 1 of 5 - Filippo F. Olivieri's Excellent Video Series on Vintage Marshall Amplifiers". PRX150-DAG attenuation level "F" (Variable Attenuation mode) providing approximately 20dB of attenuation, reducing his Marshall amp's power out to less than 1 watt. Click Here for parts 2-5 of Filippo's excellent Vintage Marshall Series. Gene Baker: Baker b3 Fire Guitar, ARACOM Evolver 50 Amp, PRX150 attenuator, recorded with a Droid X cell phone! Equipment used: Fender Reissue Strat, Sebago Double Trouble (Dumble Overdrive Special inspired) amp, Marshall 4x12 cabinet equipped with Celestion G12H Heritage 30 watt speakers (55Hz) cones. Equipment used: Reissue Marshall 1959 Super Lead, , TSR pedal, PRX150-Pro2 attenuator. Founder of the soon to be released "Get Killer Tone" DVD Series. 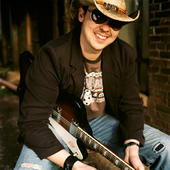 Doug is signed to Steve Vai’s Favored Nations label and he is a certified Guitar Hero. Doug’s tracks can be heard on Guitar Hero Encore: Rocks the 80’s (2007) and Guitar Hero on Tour (2008). Doug provided us with a few audio clips, which features a small sample of the gear that will be showcased in his "Get Killer Tone" DVD Series. Click Here for Doug's PRX150-Pro audio clips. 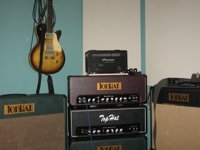 Filippo F. Olivieri, founder of the Tutorial, Performance and Gear Review site www.solodallas.net, was kind enough to provide us with many HD videos with his PRX150-DAG attenuator in use with his vintage "iconic" Marshall amplifiers. Click Here for Filippo's PRX150-DAG audio clips. Click Here for Ryleys's PRX150-Pro2 audio clips. Recording artist Manny Swan was kind enough to create the following video clips, demonstrating the operation and features of the PRX150-DAG power attenuator. Manny also provided us with an audio clip using his PRX150-DAG to reduce his cranked up 100 watt Marshall SuperLead amp down to approximately 3 watts. Manny uses his PRX150-DAG attenuator in pratice sessions and in the studio. Click Here for Manny's PRX150-DAG audio/video clips. George is a professional guitarist, song writer and producer. His work includes writing, composing and producing songs for TV Networks such as CBS. George is also the lead guitarist in the Rock of Ages band. He uses his PRX150-DAG attenuator for live performances and recording amplifiers in the studio. Click Here for George's PRX150-DAG audio/video clips. Click Here for Christophe PRX150-DAG audio/video clips. 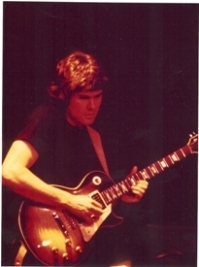 Gene Baker: President and founder of the "b3" brand of custom electric guitars and writer for Premier Guitar Magazine. Gene sent us this audio clip of him demonstrating the PRX150-Pro power attenuator at various attenuation levels. Click Here for Gene's clip. 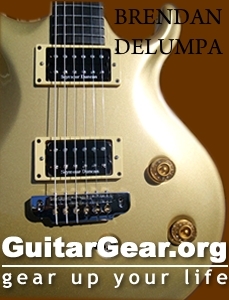 Brendan Delumpa, the founder of the GuitarGear.org, is currently working on material for his new CD. He sent us a few audio clips with recordings utilizing the PRX150-Pro power attenuator. Brendan's audio clips were recorded with his amp turned up to hit the "tonal sweet spot" and the PRX150-Pro attenuator was used to reduce the power down to "bedroom" conversational levels. Click Here for Brendan's clips. Clint is a professional song writer, singer and guitarist. He uses his PRX150-Pro attenuator in his studio on a weekly basis, to record his amplifiers at reasonably low volume levels. Click Here for Clint's clips. Krister used his PRX150-Pro to record his cranked up vintage Marshall 50 watt amp at a relatively low volume level. Click Here for Krister's clip. Paul sent us three audio clips with the PRX150-Pro set at various attenuation levels and bypassed. Each clip represents a different amplifier, guitar and playing style, which provides examples of a wide spectrum of tones. Click Here for Paul's clips. Marcus dials in the sweet spot of his Germino LV55 amp and uses the PRX150-Pro to control his overall stage volume. Click Here for the South 46 "Live" video clips. Chris sent us four audio clips demonstrating a very practical use of the PRX150-Pro. Click Here for Chris' clips. Gontran is using his PRX150-DAG attenuator to play at "bedroom" levels (less than 1 watt at the speaker cabinet) in his flat, at a volume level that does not disturb his neighbors. Click Here for Gontran's clips. 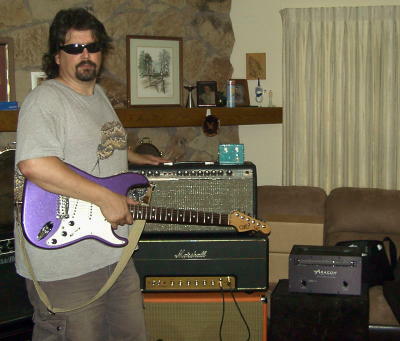 Pat is a semi-professional guitarist who provided us with a lot of video clips of the PRX150 attenuator in use with various amps, cabinets and guitars. Click Here for Pat Curtis' clips. Click Here for Bill Burgess' clips.